The original opera house space inside Antoinette Hall. Steel cables were installed to provide additional support. It’s one of the oldest second-story opera houses in the United States, and at the moment, its top floor is held together by a few steel cables. Antoinette Hall was built after the eastern side of the Giles County Square in Pulaski, Tennessee, burned in an 1867 fire. Commissioned by Angenol Cox, a wealthy businessman, at a time when people in the small community were “clamoring for amusements,” the theater was named for Cox’s wife, Antoinette. A ticket on the lower level cost 75 cents, while the seats in the balcony would run you a pricey $5. The theater and “opera house” remained open until the 1930s, hosting performers like the Davenport Brothers, a famous magic act, and Blind Tom, a formerly enslaved pianist who had a repertoire of over 7,000 songs, which he learned by ear and played from memory. The bottom two stories continued to house local businesses, most recently a clothing store. 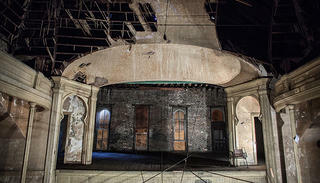 The opera house, however, with its vaulted ceilings and grand balcony, has been in slow decline since its closure. Tammy Pierchoski, executive director of the STAAR (Southern Tennessee Area Arts Repertory) Theatre, the community theater group that has occupied the building for the last 10 years, says that the first time she shone a flashlight on the opera house’s vaulted ceiling, it brought her to tears. “We’re standing outside and we’re about to sign the contract [for the lease], and I looked up and I said, ‘What’s this big tall black roof on this thing? What’s upstairs?’” she says. The former owner took her to the building’s third story, opening a pair of nailed-shut double doors with bolt cutters. Pierchoski saw a space that needed extensive work to be brought back to its former grandeur, but it stunned her all the same. 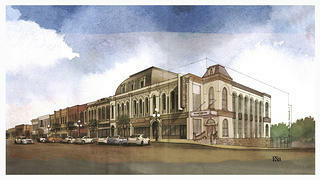 A rendering by Earl Swenson Associates of how the completed project will look. Pierchoski and other volunteers are currently spearheading an effort to fix the building’s structural issues before it’s too late. She explains that the large mansard roof on top of the structure, which was altered during a facade renovation in 1985, is pushing out the front wall and the rear wall, a realization that the STAAR Theatre group came to when country music artist Eric Paslay sent location scouts to the hall from Nashville to scope it out as a possible backdrop for a music video. After Pierchoski told the team that they couldn’t remove the steel cables that were holding the top story together during the shoot, they offered to pay for structural engineers to assess the building’s condition. The first step in Pierchoski’s plan to bring all three stories of Antoinette Hall back into use for the community is a feasibility study, slated to be completed in the middle of September. Pierchoski and other volunteers are working on a press kit that they can share with potential donors, and she hopes that they can move forward with the stabilization portion of the process in the near future. Without knowing any specifics, she pegs the estimate for the total cost of the restoration around $8 million. The restoration will return the building to its original 1868 appearance, and ideally provide the whole region with a modernized multi-cultural arts center. Antoinette Hall was listed on the Tennessee Preservation Trust’s Ten Most Endangered Places list in 2015, and Pierchoski and her STAAR Theatre colleagues hope to raise its profile to the national level in an attempt to fundraise the amount of money needed to save it.